Congrats to T.S. Joyce on her release BEAR THE HEAT! The final book in her Fire Bears series has already gone bestseller! Cora Wright is walking a fine line between standing up for what’s right, and keeping her job secure. As a local news reporter, her need to defend the Breck Crew of newly outed bear shifters risks everything she loves about her life. 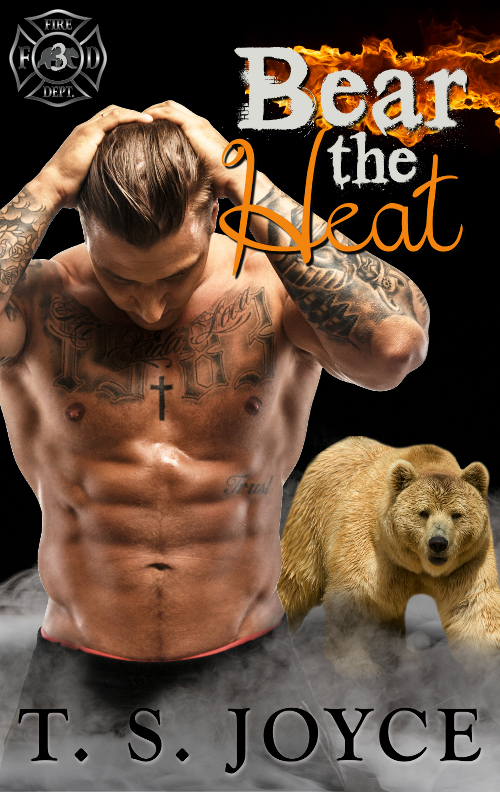 But when she meets Boone Keller, tatted up bad boy bear shifter, her world tilts dangerously on its axis. And the more he lets her into his secret life, the harder she falls for a man she isn’t supposed to love. If Boone wants to keep the fiery news reporter he’s been secretly coveting safe, the friend-zone is where she’ll have to stay. He’s been doing a bang-up job of avoiding the woman who has been publicly rallying for his crew, but a chance meeting with Cora is killing his reserve. And when she shuts down his attempt to push her away, he’ll have to decide whether to draw her in close to protect her from his secrets, or cut her loose to save her life.